This word has become my standard reply to everything over the last few days. Not very articulate for a writer, but a result of adventure tourism leveling out my brain to a state of wide-eyed calm. ‘Wooowwwww….’ I find myself breathing out. 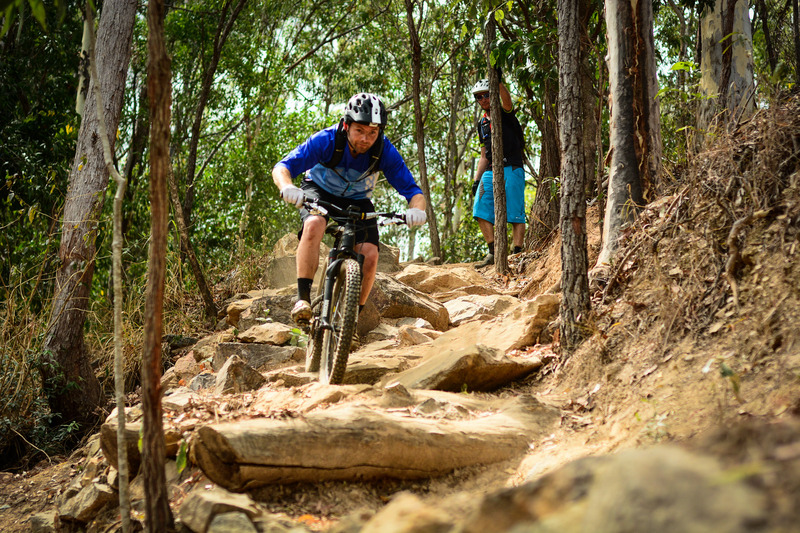 The trails at Smithfield in Cairns. The secret jungle trail I rode afterwards. A night ride in Port Douglas spotting rare frogs on the side of the trail. A day spent snorkelling on the Great Barrier Reef. Setting up my mobile office on a boat. The stories told by the people I’ve met. Each coffee. Each smoothie. Each swim in the ocean. Beware, the experiences you’ll have here are off the chart. Photo: Kath Bicknell. Dazzled by bright tropical colours and still trying to process the last few days, this word seems to be all I can muster in response to a volcano of mind-blowing experiences. Spending a week in Tropical North Queensland makes me so proud to be Aussie and even more in awe of this incredible country. 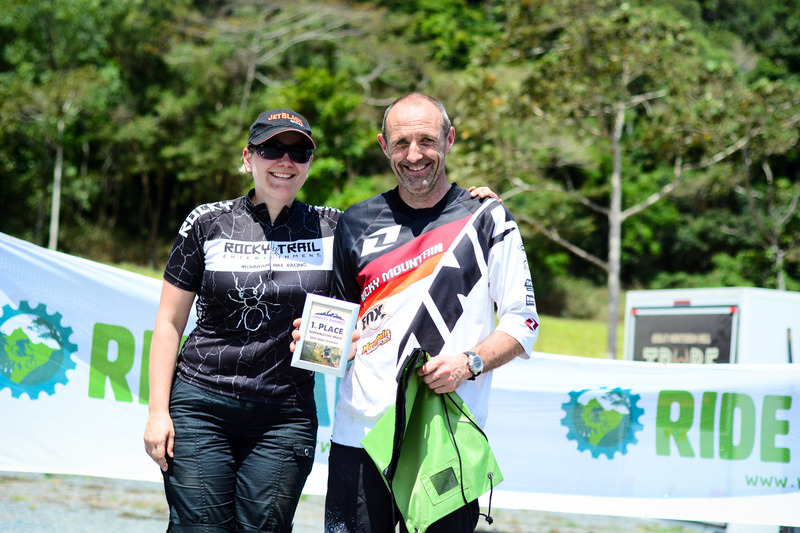 The impetus for the trip was to race the final round of the Australian Gravity Enduro Series. Even more wows keep falling out of my mouth as the experiences this sport provides keep multiplying the impact of the trip even more so. 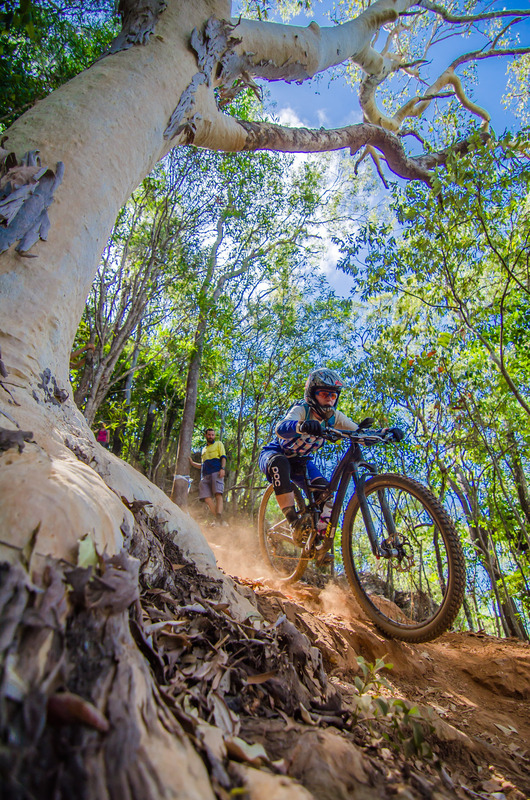 Round six of the Australian Gravity Enduro Series took place at Smithfield, just outside of Cairns on Saturday and Sunday. Six timed stages, over two days of racing, basically took competitors down a series of downhill runs. Some were from over ten years ago, one was the old national downhill, two runs took in parts of the track used in the recent world cup. Some of the most technical and playful features of the cross-country world cup course were thrown in too. 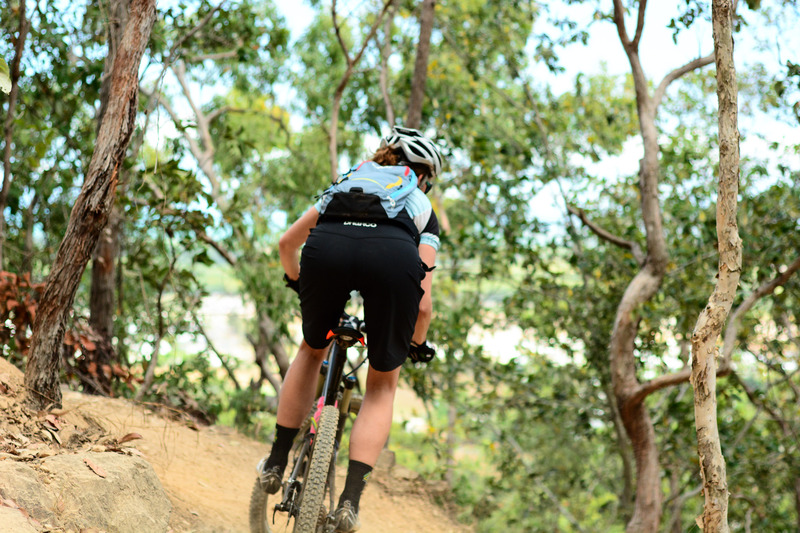 Trails and track features have names like Croc Teeth, Happys and Vines. Ben Randall practices Croc Teeth. Photo: Kath Bicknell. Over the weekend I learned many new skills, like how to put knee pads on the right way around. Photo: Rosemary Barnes. It was so surreal riding these tracks for the first time having watched them during the live video coverage earlier in the year. In real life everything was steeper, better and even more fun due to the low pressure that surrounds an enduro event rather than a high level XC or DH race. The access roads to the top of each trail were so steep that most riders had to push their bikes to the top. It was so hot you could see big drops of sweat on the ground from riders pushing their bikes in front. I never felt hot, but my clothes were permanently soaked indicating what a good job my body was doing of keeping me cool. The way back down the hill was steep, loose and so much fun. Photo: RideCairns. 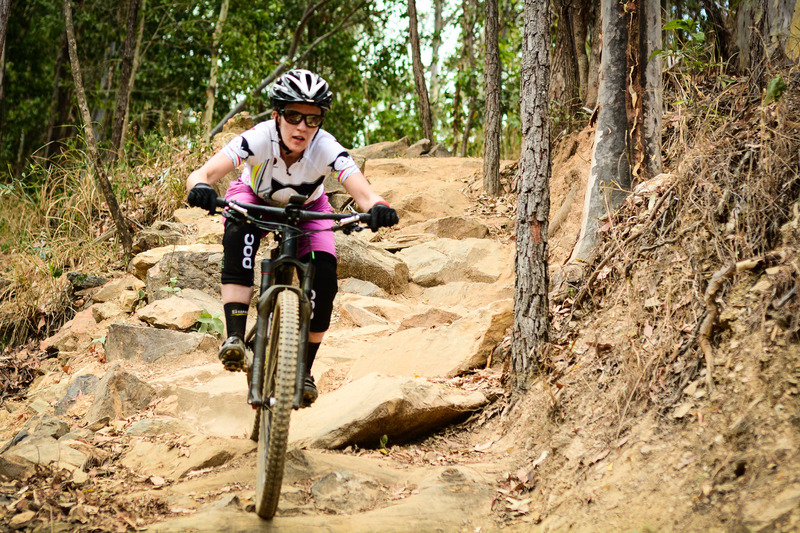 In the women’s competition Gen McKew thrived on the fast, steep and technical descents. Rosie Barnes and Ness Thompson were never far behind. Me, I thrived on practicing the trails with these girls. I loved getting faster with every run, learning about the different speed, stability and buttery plushness that comes with a good fitting trail bike. I even came second in the final of six stages. 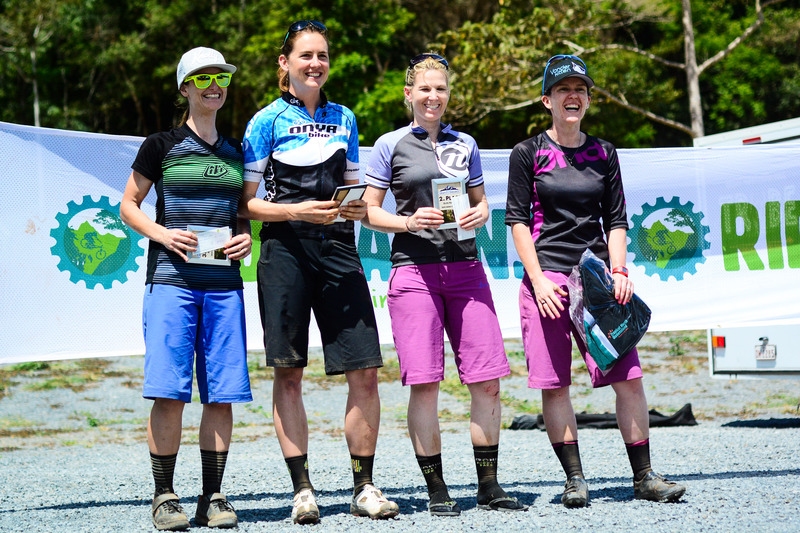 DHaRCO shorts ruled the women’s podium. L-R: Gen McKew, Rosemary Barnes, Vanessa Thompson, Kath B. Image: Dave Empey. Rosie took the series win, Gen took the day and Ness rode to third with four stitches in her knee. I rounded out the podium in fourth and was proud to wrap up the series in fifth. Dave Empey was undefeated in the Super-Masters. I hope I can ride that fast one day! Photo: Kath Bicknell. One of the things I keep wondering as I reflect on this event is, ‘Why race? Why not just come up to trails like these for a holiday?’ The conclusion I’ve reached is that I enjoy the competition provided by the racing, but what I enjoy even more are the experiences that arise due when people travel somewhere together for an event. The event provides the scaffolding for additional experiences to arise. Practicing downhill trails following series winner Dan McMunn and Super-Masters trail blitzer Dave Empey. Sessioning the world cup downhill and cross-country trails with a growing bunch of women who enjoy technical trail riding as much as I do. The travel and tourism adventures that come with booking a few days in each new destination, and getting an insight into the rich cycling cultures in these different cities. A break. A refresh. A heap of adrenaline and a healthy dose of calm. Being reduced to a constant state of breathing in, wow-ing out. Rocky Trail Entertainment’s Juliane Wistata took a post-race breather on Mission Beach. Thanks guys for such a fun series. Photo: Kath Bicknell. To support the racing side of this adventure, Roxsolt have helped me with some of the additional travel costs. The team behind this artisan consulting company and are big supporters of women’s cycling. They also support the Sydney Uni Velo Women’s road race team and the Boss Racing Team. They’ve been an invaluable source of advice to me for better understanding some of the project and consultancy aspects of my own work, too. In return I’ve offered to run some skills clinics to skill up some of their road riders and provide feedback on some of the women’s clothing products they’re bringing in through a new arm, Roxcycl. I looked at the Vanderkitten range earlier this year (and before this arrangement) for Bike Radar, but am curious to learn about the more boutique Velocio clothing. The high heat and humidity here is a great test for how their brands will handle higher temperatures once summer hits everywhere else. 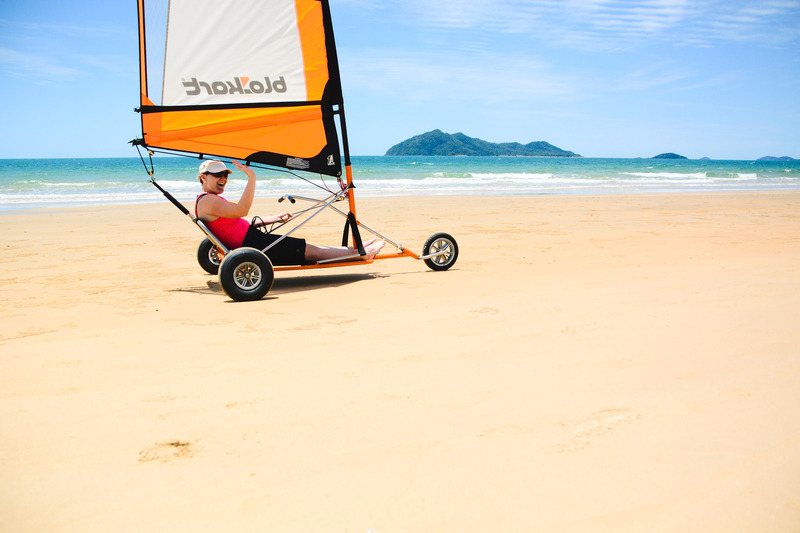 I’m based in Cairns until Monday as a guest of Tourism Tropical North Queensland and due to the hard work of Rocky Trail Entertainment. I’ll be taking in more trails in the region, writing articles for SBS Cycling Central, and finishing up with the first two stages of the Crocodile Trophy. This nine-day stage race pushes riders to different limits in terms of experiences and bodily capabilities too. A racing (working) vacation. Not a bad way to get your wow fix. Where are you headed next? Keep an eye on Cycling Central for articles as they’re published, or click here for links and images posted on Twitter. 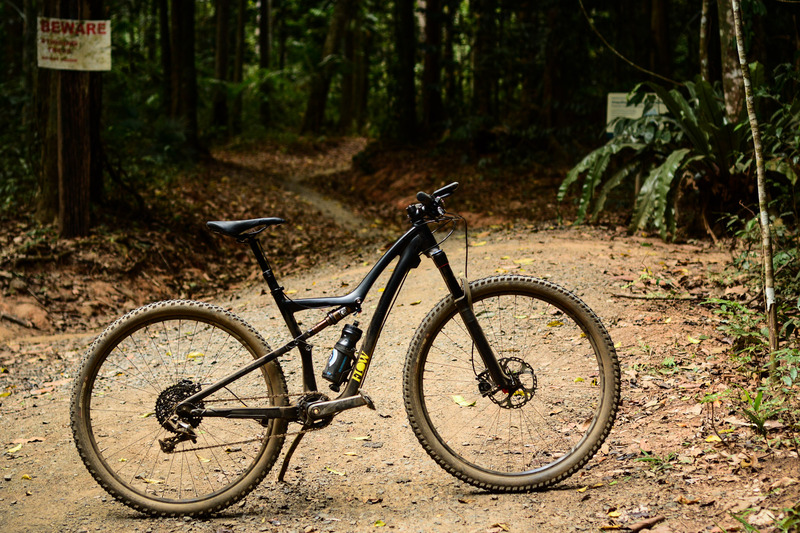 This link will take you to the first impressions on the Specialized Rumor Expert Evo 29 trail bike I’m testing for Flow Mountain Bike while I’m here.